If you just happen to be heading from Bridgend in a Port Charlotte direction when the sun is setting behind Black Rock I love and miss that view. This is coming from Bridgend, just before the road reaches Carnain and turns inland. Black Rock isn't on the picture, that's just a tiny bit to the right. In the distance are Bruichladdich on the right, Beinn Tart a'Mhill and Port Charlotte on the left. It was just after high tide, so not much of the sand is visible. 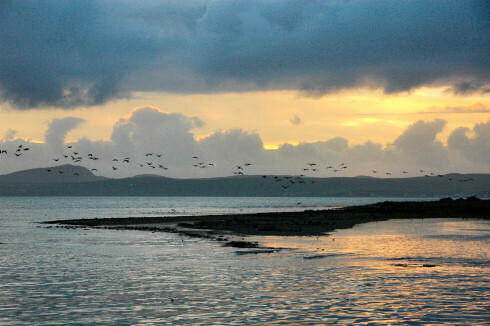 A few geese fly in to roost, not nearly as many as there are during low tide. And with that all that remains is to say, have a great weekend, whatever you do, be it resting or having a busy weekend with lots of activities!